Editors Note: There are four photos associated with this press release. OpenAire's latest project in Chicago, Illinois is sure to make a great impression with customers looking for luxurious home décor and furnishings. 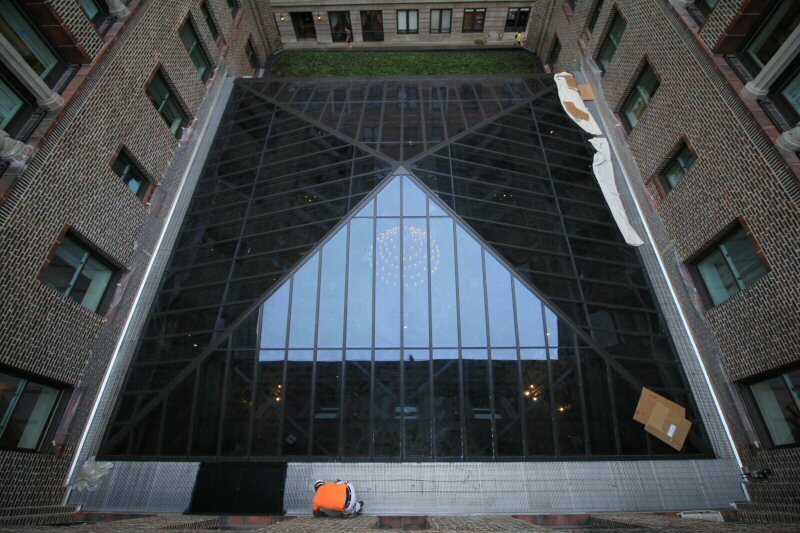 Restoration Hardware commissioned a custom-built, pyramid-shaped glass skylight for the roof of its new 58,000-square-foot location on North Dearborn Street in the Gold Coast neighbourhood. The Gallery opened its doors to the public on October 2nd. 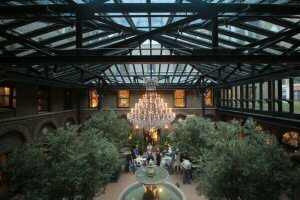 Customers visiting the new store, dubbed RH Gallery, will be able to enjoy a stunning, classically-inspired courtyard, complete with café and fountain that is flooded with natural light no matter what the weather or season. It is a spectacular place for shoppers to relax and socialize all year-round, thanks in part to the innovative 44 by 44 foot glass roof above the courtyard and with a front wall of opening windows designed, manufactured and installed by OpenAire. "It's been great to work with Restoration Hardware, Booth Hansen Architects and Pepper Construction to create this unique location," says Mark Albertine, President and CEO of OpenAire, "Our teamwork resulted in an enclosure that fits the gallery's design. It's an opportunity to create a completely original, harmonious space, taking the store to another level and making a courtyard with an outdoor feel that can be enjoyed in any weather - the result is stunning. OpenAire is proud to have completed this elegant new structure; it's changing the face of retail venues." 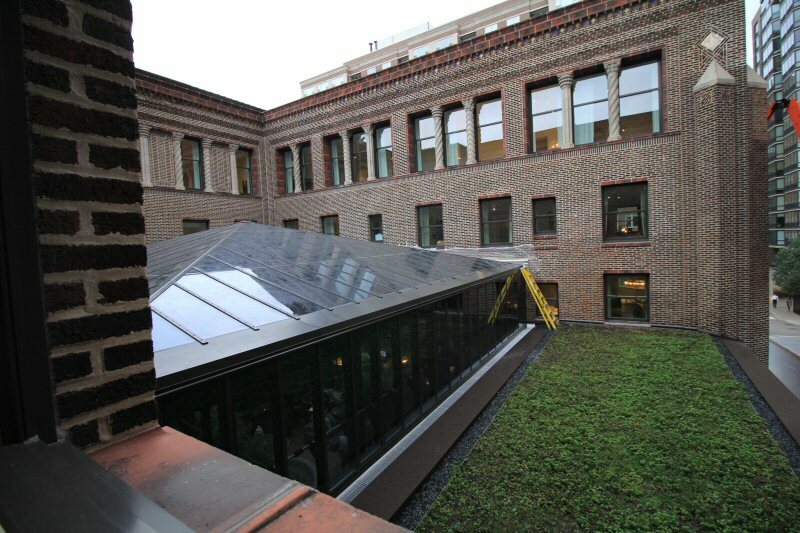 The innovative design and placement of the new skylight required OpenAire's design and engineering team to be especially creative. The majestic, spacious design of the skylight features operable side glass panels that open to allow air flow and ventilation into the courtyard. "We custom-design a powerful drive mechanism strong enough to ensure that ten of twenty windows, each measuring 2 by 12 foot and weight of up-to 200 pounds, open outward easily. The entire mechanism is maintenance-free for life and requires no lubrication, thanks to the use of polymer bearings," says Martin Step, Senior Mechanical Engineer at OpenAire. "In the end, the team rose to the challenge of building and installing something that will work effortlessly and beautifully, while also fitting into RH's desired old fashioned railway station motif for the location." Thanks to this dedication, the RH Gallery has an inviting courtyard filled with abundance of natural light and fresh air that will awe customers and benefit the company greatly. The skylight and operable windows reduce the need for lighting, which will save Restoration Hardware energy while also creating an impressive gallery space for years to come. OpenAire has been designing and manufacturing beautiful, high-quality, environmentally conscious retractable roof structures and skylights for over 25 years. 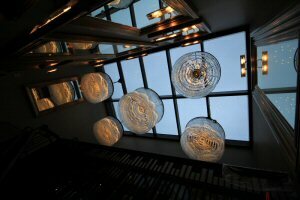 We bring unique visions to life from initial design to installation, transforming buildings into sunlit spaces customers love. Our 600+ commercial projects include Zehnder's Splash Village in Frankenmuth MI, US; Aqua Sferra Water Park (the biggest aluminum dome in the world) in Donetsk, Ukraine; Tropicana Water Park in Stadthagen, Germany; the Rooftop Bar at the Refinery Hotel in New York City, and the Palms Casino & Resort in Las Vegas. Headquartered in Oakville, Ontario, OpenAire has worked throughout North America, Europe and the Middle East. To learn more about OpenAire Inc.'s projects and capabilities, visit http://www.openaire.com/ and follow us on https://twitter.com/openaire1. For more details on this project, please e-mail sales@openaire.com. Restoration Hardware (HR) is a luxury brand in the home furnishings marketplace offering furniture, lighting, textiles, bathware, décor, outdoor and garden, as well as baby & child products. RH operates an integrated business with multiple channels of distribution including Galleries, Source Books and websites. 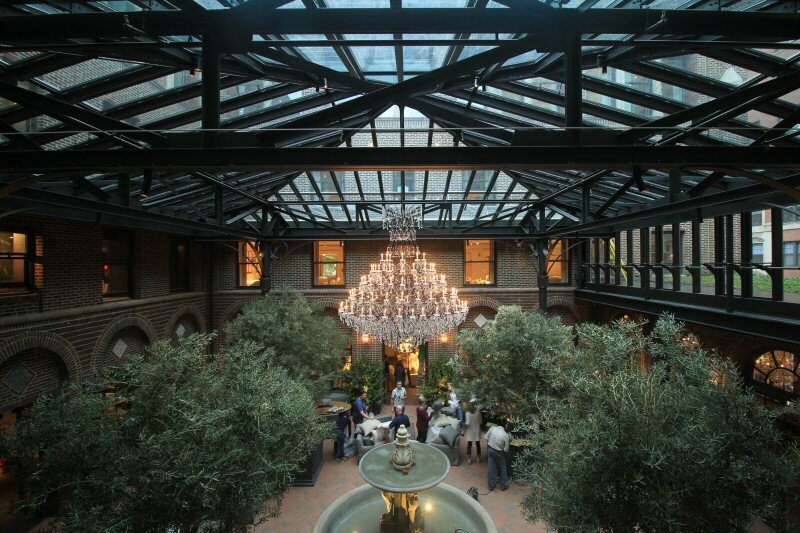 Restoration Hardware (RH) Courtyard with OpenAire glass roof and windows. Front wall of 2ft X12ft operable windows.